A few years ago, my husband surprised me with an anniversary dinner at my favorite Italian restaurant, Cucina Urbana. The most memorable dish we had that night was the fried zucchini blossoms, stuffed with ricotta cheese and served with a dollop of basil pesto and lemon aioli. We were taken by surprise at how a delicate flower when paired with ricotta cheese, pesto, and lemon would bring such depth of flavor. Ever since, I have been recreating this delightful anti-pasti whenever summer comes around and zucchini blossoms start appearing at the farmers market. I played around with different ingredients and found that crab and ricotta make the perfect filling. Instead of basil pesto and lemon aioli, I kept things simple and drizzled a little bit of black truffle oil on the fried zucchini blossoms. 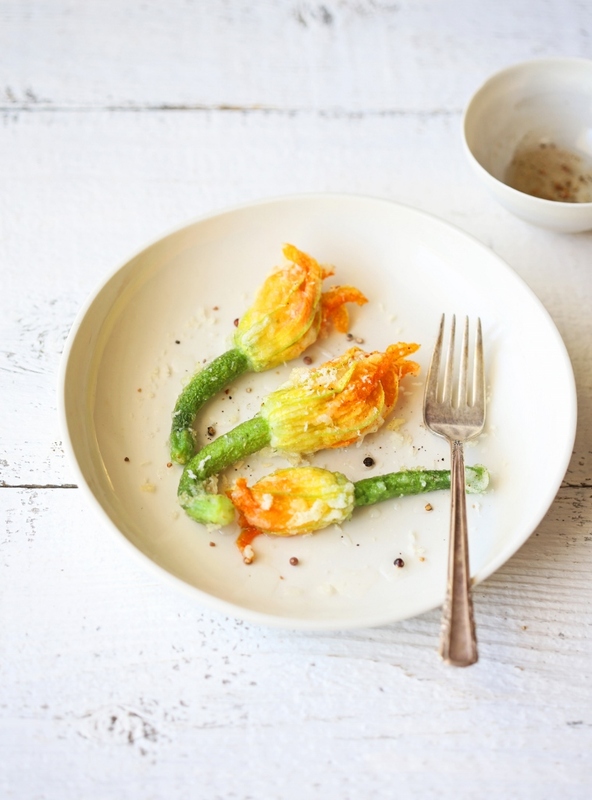 The stuffed zucchini flowers when fried are slightly crunchy on the exterior but literally melt in your mouth and the truffle oil creates an exquisite taste. 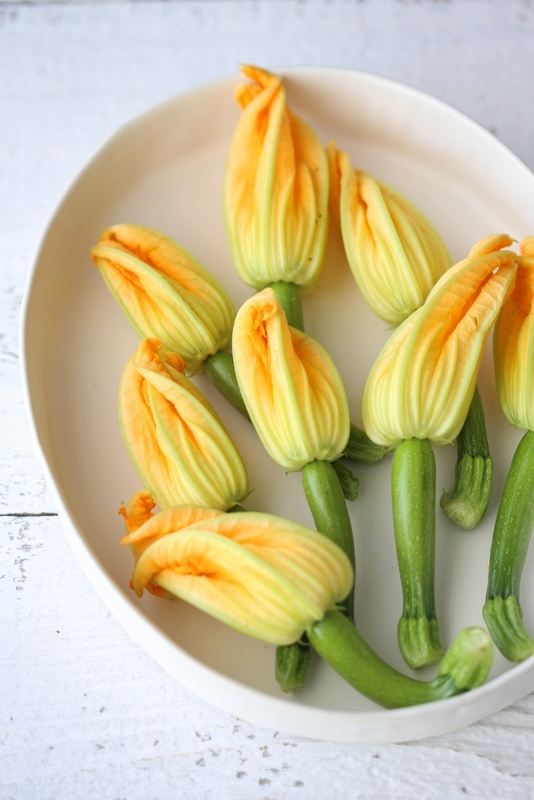 Zucchini blossoms won’t be appearing at the farmers market for very long so grab them while you can! 1. To make the tempura batter, whisk cornstarch, potato starch, club soda, egg, baking powder, and salt until just combined. Don’t worry if the batter has a few lumps. 2. Combine ricotta cheese, mozzarella, crab meat, and lemon zest in a small bowl. 3. 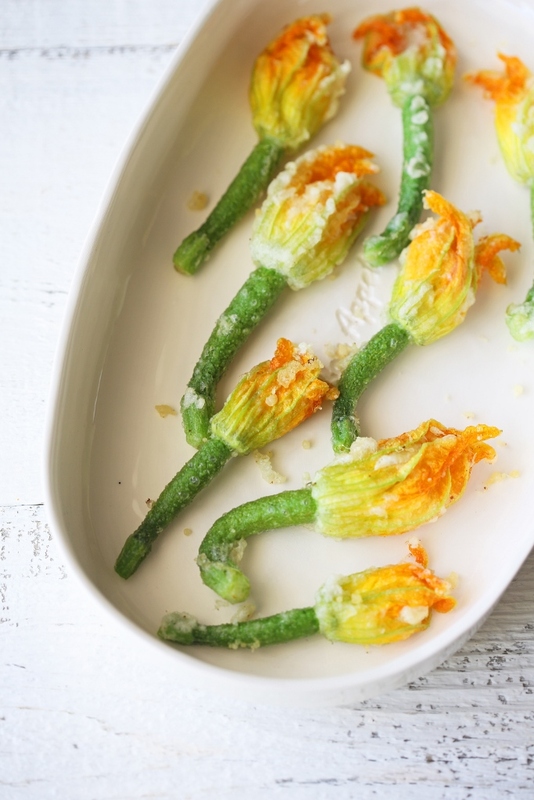 Gently open the zucchini blossoms, taking care not to tear the petals, remove and discard the yellow stamen inside. 4. Fill with the ricotta mixture, about ½ to 1 tablespoon, then twist the tips of the petals gently to enclose the filling. 5. Heat a large saucepan on medium-high heat with about 2 inches of oil. 6. In batches, dip zucchini blossoms in the batter, shaking off excess batter. 7. Deep fry the blossoms until light golden brown and crisp, about 2 minutes. Drain on paper towel.8. 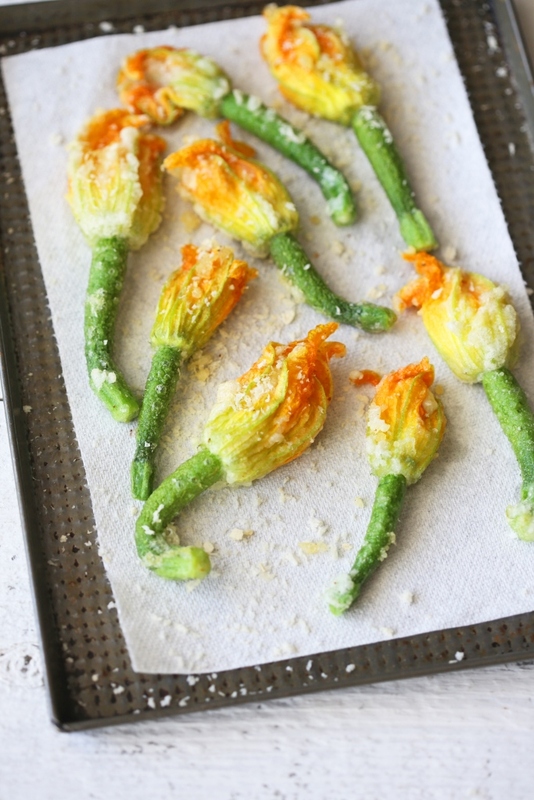 When ready to serve, place the drained zucchini blossoms on a plate and drizzle with truffle oil.